The AREPH is located in Brownlow Hill, near the suburb of Camden in South West Sydney. 415 Werombi Road, Brownlow Hill. If you are concerned about veterinary expenses, VetPay is company that can help you pay for veterinary expenses without the worry of high upfront costs. It will allow you to start your pet’s treatment now and pay for it over time. The company will set up a payment plan and debit your bank account or credit card and pay your vet for the services provided for you. VetPay is not a part of AREPH and terms and conditions apply. 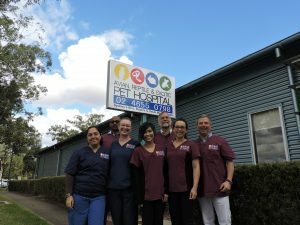 Sydney After Hours Veterinary Emergency Service (SAVES) on the main campus of the University of Sydney at Camperdown on 02 9351 3437. Ingleburn Vet Hospital, who can contact our vets 24 hours a day for advice or instruction, on 02 9829 1947. Please ensure you advise the clinic before bringing in a venomous snake. Being a university teaching hospital we have a high turnover of students coming through our clinic each week who may not have the appropriate vaccinations. Unfortunately, for this reason, it is University policy that we do not see bats here at AREPH. Learn more.